Are you looking for WBCS Main Exam Full Pattern? How many numbers on Personality Test? Then This post is very important to you. You know that WBCS preliminary Exam ends. So Candidates should start practice for Main Examination. Before the practice, you must know about proper Exam Pattern and Number Division of WBCS Main Exam. So we solve this problem. 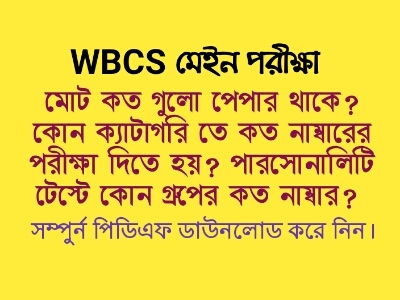 Today GK Solve share WBCS Main Exam Total Subject, Number Division, Personality Test Number pdf download link. This pdf is the most important for Every WBCS Candidates. So all the Readers are requested to download this pdf as soon as quickly and start your proper practice.